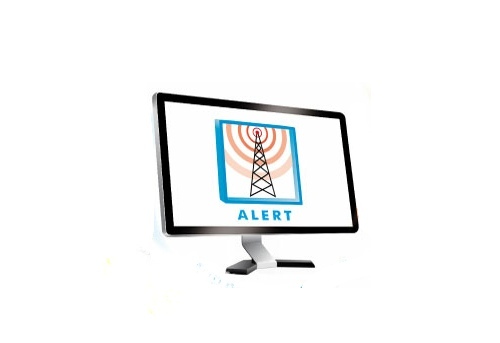 Alert monitors and centralizes data and alarms from a variety of automated applications (SCADA systems , PLCs, remote monitoring sites) and runs on Windows. 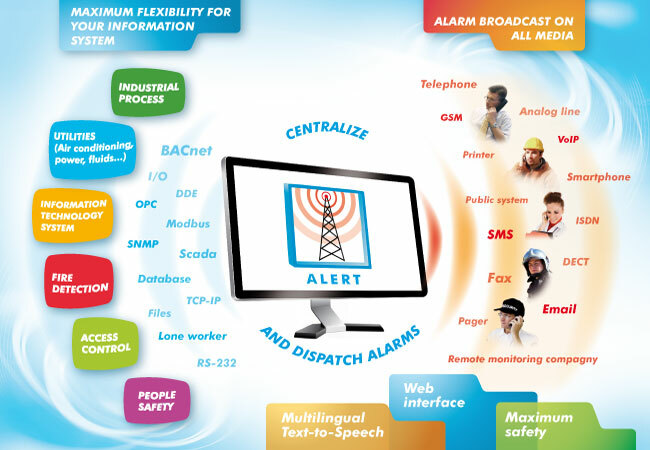 Industrial SCADA systems via Alert’s integrated OPC interface or specific modules (Intouch, AppServer, WinCC, PCVue, Cimplicity, Citect ...), which are supplied by default with the software. 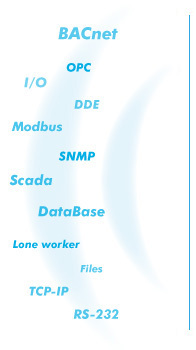 Industrial PLCs or controllers via the OPC interface (Data Access, Alarms & Events). External applications or devices via scripts that process the exchange protocol between Alert and these applications / devices (serial link, IP, file, database, email, SMS ...). External applications, through its programming interface (API) or command lines. WEB server through a script of the Message Processor. Landline and mobile telephone, as well as Walkie–Talkie, to directly contact the operators and transmit information by voice with immediate call acknowledgement and possibility to acknowledge the alarms. Compatible with all technologies: analog, digital (ISDN), VoIP. 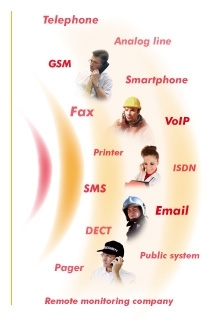 SMS, mini–messages on DECT phone (Alcatel, Aastra, Siemens …) to Alert mobile operators with written messages. Pager / Beeper to rapidly inform onsite operators. 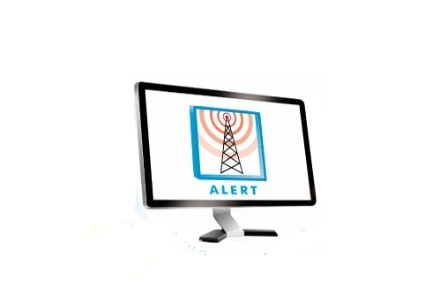 When an alarm is detected, the operators who have to be warned, are selected based on their on–call group membership attached to the alarm and the on–call schedule associated to each group. The selected operators are reached using media on the numbers assigned to them in their call list. Calls are made according to their order in the list until the operator is considered effectively warned (call transmitted and acknowledged). Multilingual visual interface (English, French, German, Italian, Spanish, Portuguese, Dutch, Chinese).